My grandmother was very old. Her hair was white as bone, and her bones were thin as stems of feathers. She sat in her rocking chair with the bright green window open behind her, and the dim, dusty room of varnished wood and books and photographs before her. I carried her orange pekoe tea in a china cup that rattled like teeth in its saucer. In the back, my grandfather was tending his roses. He moved very slowly, but still liked to be out in the sunlight, which glanced off his pruning shears and danced among the rose leaves like copper-colored flames. Her chair creaked. She smiled. She’d been at home one afternoon sweeping the shimmering dust from the porch, she said, when he pulled up on a silver motorcycle, then stood outside on the sidewalk with his hands on his hips, looking up at the house. “What a beautiful machine,” she called out to the man. “Are you coming or not?” the man called back. It seemed this was no ordinary motorcycle, and no ordinary man. Would it be worth two days of her life to ride one afternoon with him? He sped so fast on that motorcycle, all the houses and stores blurred in a streak of primary colors until they gave way to pale, silvery trees, rock and dust. She pressed her open knees against the outsides of his hip bones as he rode, and wrapped her arms around him and held her face close to his clean cotton jacket, which smelled of soap and sunshine and wind. They rode way out of town, up the incline of the mesa sprayed with mineral glitter, and through the rock walls that stood like a gateway of stone, until they reached the little town of Dust—just a gas station, a little motel painted sky-blue, and an ice cream stand with picnic benches set up on a gravel parking lot that sloped down to a creek of cold, clear snowmelt. It was too chilly in the wind for ice cream, but he ordered them a vanilla scoop anyway, and she sat on his knee, and he put his jacket over her shoulders. Now, out on the street behind her, a car sped past with its windows down, its radio blaring a song I knew—one that made my heart beat way down in my belly, that made me sway my hips a little whenever I heard it as I combed my hair in front of my bedroom mirror. Every time he came for her—mid-morning while she was washing dishes, or just before evening, as she was preparing supper—she went with him. And every time, they rode farther and farther and farther away, forcing them to speed faster and faster and faster upon their return. Three days’ distance from home, two weeks’, a year’s, until finally he took her so far that as he sped her back down the highway over the mesa, night falling like dark velvet curtains all around them, her brown hair brightened into a lustrous silver. When she stepped back into the house and saw herself in the hall mirror, she put her hand to her mouth and giggled, and her eyes filled with tears. “That night at dinner, your grandfather reached across the kitchen table and touched my hair, and his eyes filled with tears, too. ‘What have you done with my girl?’” he asked. My grandmother leaned her head back in her chair and closed her eyes. I carried her teacup to the kitchen sink and went out back. There stood the stout old apple tree, and a little wooden shed. Inside the shed, my grandfather’s garden tools were lined up and hanging on black nails. All the wooden handles were darkened with age and dirt, and rubbed as smooth as polished stone. The wind rattled the door behind me, and I could hear my grandfather alone in the vegetable garden, where he grew endive and rhubarb and swiss chard. He was unrecognizable from the framed photographs inside, in which he sat smiling beside my grandmother, his hair dark and slick, his skin tanned, and his muscles taut beneath his fitted white shirt. Now his back was stooped and his shoulders narrow. In the shed, behind the old push lawnmower, a dirty gray tarp hung over an old machine. I stared at it for a long time, making out its shape, until my grandfather came up behind me. “What is it?” I asked, though I knew. The tarp did not quite cover the tires, and back in the shadows, one of the handlebars was exposed. I wondered briefly how my grandfather had come to possess it, and whether the remains of the young man to whom it had once belonged could be found somewhere in the yard, or in his garden. It seemed to me, then, that my grandfather’s glance confirmed my suspicions. 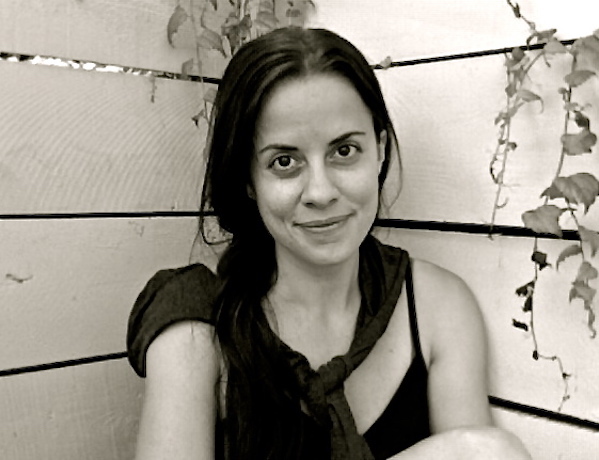 Bonnie Nadzam has published fiction and essays in Granta, Harper’s Magazine, Orion Magazine, The Iowa Review, Epoch, The Kenyon Review, and many others. Her first novel, Lamb, was recipient of the Center for Fiction’s First Novel Prize in 2011, and was longlisted for the Baileys Women’s Prize for Fiction. It has been translated into several languages and made into a film that will be released in 2016. Her second novel, Lions, will be out from Grove Press in 2016. She is also co-author with Dale Jamieson of Love in the Anthropocene (OR Books, 2015).